After years of partial involvement in the music industry, New Jersey born performer Susan Cattaneo decided to immerse her into a fully fledged recording career in 2009 and the drift westward from her east cost upbringing is reflected in a search for her musical soul via a trawl through America’s heartland. Her first couple of full length albums reflected a move from general Americana towards country and this journey has continued with the release of this smaller seven-track record that contains all the hallmarks of a 21st Century Nashville production. The feel is very much contemporary and if falling in the right hands could lead to some radio airplay and the rich pickings that may follow such a direction. If you like your country, traditional, rootsy, raw and authentic then this is probably not the album for you but on the other hand, the slick Nashville way of slightly blending those sounds into the background and still retaining a country feel has presented Susan with the opportunity to pursue the ever growing markets for this strand of modern music. The reason for the lack of tracks on this album is unsure but those who have previously enjoyed her music may also be slightly disappointed by its title track being lifted from her 2011 release as well, albeit with a more souped-up production. 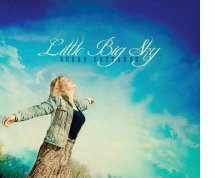 ‘Little Big Sky’ – the song – has been promoted as a single since the turn of the year and is a slightly clichéd account of escaping city life, drinking sweet iced tea while sitting on a front porch swing. The country theme is also explored in the quintessential reflective song ‘Pennies on the Rail’ which is probably the album’s standout number. Of the other tracks, ‘Spare Parts’ does take a slightly different direction with a more rock-oriented sound and the vocals possessing a greater edgy feel to them.’ Let the Music Deliver Me’, the album’s opening track is your prototypical modern Nashville production where if you listen carefully you can detect some fiddle and steel. The ballad-like number ‘Alice in Wonder’ with its references to Lewis Carroll’s classic doesn’t really work and adds little value to this short record. The album’s final track ‘Better Day’ is a piano-led show closer that manages to do its job well. Susan has previously had some success in Europe and while this fairly safe, conservative release is in line with what’s being churned out from Nashville’s major labels, the home market could be a little too crowded, leaving probable opportunities more likely this side of the pond again. Susan has spent time in Italy amongst other countries promoting her music and could do worse than explore opportunities this side of the channel as well.